Episode four offers a few more character introductions that are sure to please fans—Samwell Tarly and Gregor Clegane, the Mountain that Rides, deserve special mention—but plenty of room is also given to developing existing characters and to further several storylines, in particular in King’s Landing. 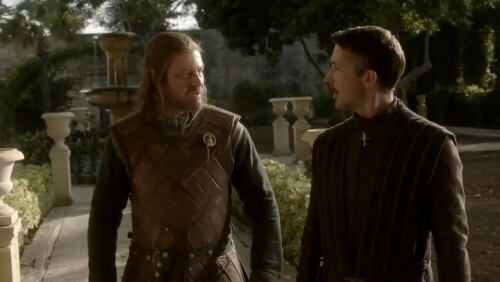 Ned is starting to get a sense of just how much more complex life in the capital is thanks to the ever so helpful Lord Baelish; Aiden Gillen continues to be delightful in the role. We also get a first look at a certain ponderous tome and at a bull-headed young man. And while Lord Stark himself could do without the tourney being put on in his name, the rest of the court (except for the Queen) seems more enthused. Sansa certainly seems to appreciate the pageantry more than the history lesson she gets from Septa Mordane, though we expect that fans will not mind either! We also get a brief look the wolves at Winterfell and the scenes there also include more of everyone’s favourite stableboy—and this time he speaks, too!—as well as some more insights into a certain ward of the Starks. Across the Narrow Sea, Daenerys and the Dothraki finally reach Vaes Dothrak and it becomes the setting for one scene that reveals a fair bit more about the Targaryens and their dragons (which one character seems to find very exciting) as well as an important confrontation between the two Targaryen siblings. The episode concludes with an unfortunate encounter.